Refer to the footnote for lot 693 for a discussion on glass imitating semi-precious stones. It is very likely that the pale green glass from which the present example was intended to imitate beryl. 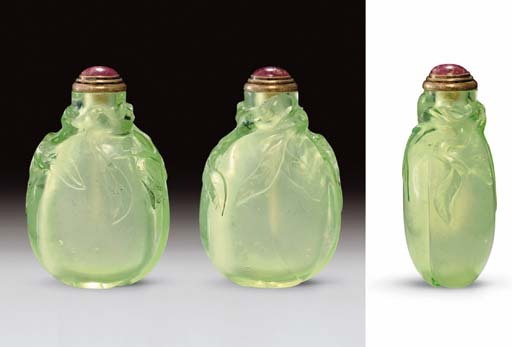 While this appears to be the only known example of the design imitating beryl, the peach was a reasonably popular Imperial design found also in other colors of glass, nephrite and other materials. There is also an example in tourmaline from the Franz Collection (Hedda & Lutz Franz, China Blues, An Elegant Obsession, Compact Disc, Hong Kong, 1999). See also a blue glass example in the Bloch Collection, illustrated by Moss, Graham, Tsang, A Treasury of Chinese Snuff Bottles, Vol. 5, Glass, no. 839, where there is reference to another in yellow glass, bearing testimony to the Imperial nature of the design. For a discussion on the symbolism of the peach, see the footnote under lot 605.